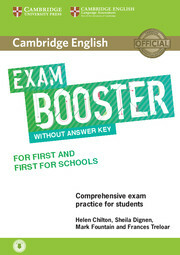 Zoom in on essential exam practice with the Cambridge English Exam Boosters. Maximise learners’ potential with dedicated exam task practice for class or home study. Use alongside a coursebook or as intensive exam practice. Available for Cambridge English exams: Key and Key for Schools, Preliminary and Preliminary for Schools, First and First for Schools. Suitable for either the standard and the 'for Schools' versions of the exams. Get an eSample of Cambridge English Exam Boosters that will allow you to view a product preview on your desktop.